The UNESCO Convention for the Safeguarding of the Intangible Cultural Heritage came into force in 2006, framing the international and national practices and policies associated with intangible cultural heritage. 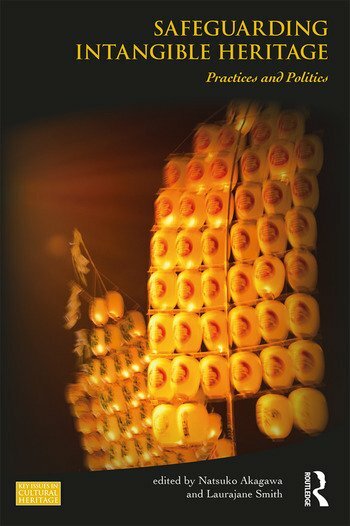 This volume critically and reflexively examines these practices and policies, providing an accessible account of the different ways in which intangible cultural heritage has been defined and managed in both national and international contexts. As Safeguarding Intangible Heritage reveals, the concept and practices of safeguarding are complicated and often contested, and there is a need for international debate about the meaning, nature and value of heritage and what it means to ‘safeguard’ it. Safeguarding Intangible Heritage presents a significant cross section of ideas and practices from some of the key academics and practitioners working in the area, whose areas of expertise span anthropology, law, heritage studies, linguistics, archaeology, museum studies, folklore, architecture, Indigenous studies and history. The chapters in this volume give an overarching analysis of international policy and practice and critically frame case studies that analyze practices from a range of countries, including Australia, Canada, China, Indonesia, Japan, Korea, Kyrgyzstan, New Zealand, Taiwan, the UK and Zimbabwe. With a focus on conceptual and theoretical issues, this follow-up to Intangible Heritage, by the same editors, will be of great interest to students, scholars and professionals working in the fields of heritage and museum studies, heritage conservation, heritage tourism, global history, international relations, art and architectural history, and linguists. Natsuko Akagawa has a PhD and Masters in Cultural Heritage and Museum Studies, a Masters in Business Administration, a Graduate Diploma of Education, and a Diploma of Portuguese Language and Culture. Currently Lecturer at The University of Queensland, Australia, she was previously Assistant Professor at The University of Western Australia. She is the author of Heritage Conservation in Japan’s Cultural Diplomacy (2014), which establishes a pioneering theoretical nexus between the politics of cultural diplomacy, heritage conservation, and national identity and interest, and has become a focus for scholars in a range of disciplines. She is also the co-editor of Intangible Heritage (2009, with Laurajane Smith). Her research focuses on the way heritage assembles histories, memories, identities and emotions as articulated in policies, practices and imaginaries. She is Expert Member and Vice-President of the International Committee on Intangible Heritage of ICOMOS. She has been a visiting research fellow at the East–West Centre and University of Hawaii, Manoa, as well as a Fellow at the International Institute of Asian Studies with Leiden University, Netherlands. Laurajane Smith is Professor and Director of the Centre of Heritage and Museum Studies, and Head of the School of Archaeology and Anthropology at the Australian National University. She has authored Uses of Heritage (2006) and Archaeological Theory and the Politics of Cultural Heritage (2004), and co-authored Heritage, Communities and Archaeology (2013). Her edited books include Heritage, Labour and the Working Classes (2011, with Paul A. Shackel and Gary Campbell), Representing Enslavement and Abolition in Museums (2011, with G. Cubitt, R. Wilson and K. Fouseki) and Intangible Heritage (2009, with Natsuko Akagawa). She is editor of the International Journal of Heritage Studies and co-general editor (with William Logan) of the series Key Issues in Cultural Heritage.